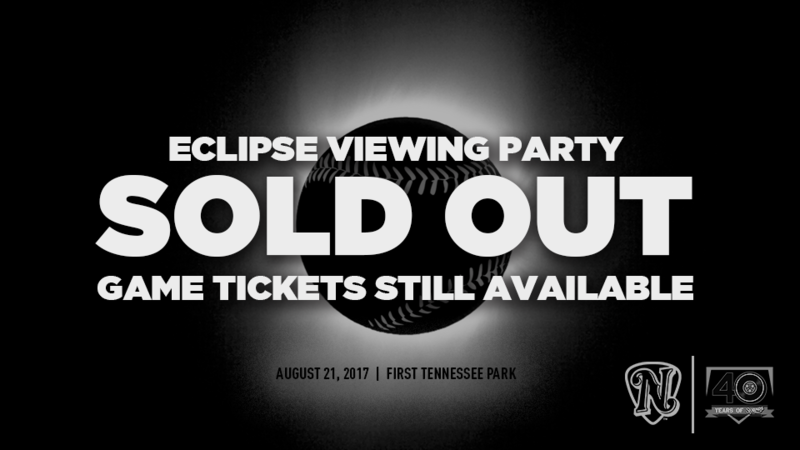 The Nashville Sounds, in conjunction with Nashville Mayor Megan Barry, Metro Government, the Metro Sports Authority, and the Adventure Science Center, have announced the festivities for the total solar eclipse viewing party at First Tennessee Park on Monday, August 21. For the first time since 1918, a total solar eclipse will sweep across the United States and Nashville is the largest city in its path. The event will include music by members of the Nashville Symphony, science demonstrations with fun, hands-on activities from the Adventure Science Center, total solar eclipse viewing, and a separate Sounds baseball game to follow at 4:05 p.m.
Gates to First Tennessee Park open at 10:30 a.m. Mayor Barry will welcome the crowd at 11:00, with astronomy demonstrations and audience participation. Everybody in attendance will receive special solar glasses that will allow for safe viewing of the eclipse. Seating for the viewing party will be on a first-come, first-served basis (excluding club level and group areas). The beginning of the eclipse will occur at 11:58 a.m. and last until totality at 1:29 p.m. At 1:25, the ballpark lights will be turned off in preparation for totality. The start of totality will begin at 1:27 and will last nearly two minutes. Following the viewing party, the ballpark will be cleared at 2:00 and re-opened at 3:00 for the Nashville Sounds game against the Iowa Cubs. Mayor Barry will throw out the ceremonial first pitch at 3:50 prior to the Sounds taking on the Cubs at 4:05. Tickets to the Sounds game are on sale now at the Nashville Sounds ticket office and online at www.nashvillesounds.com. PARKING INFO: The City of Nashville, in conjunction with the Nashville Downtown Partnership, will provide free parking and shuttles from Nissan Stadium to and from First Tennessee Park for the eclipse event. Public parking will be available in Lots R, T, P, & N at Nissan Stadium. The free shuttle will depart from and return to Parking Lot R.